Why is Mercury in Fish Such a Problem Today? Drew F. asks: Why is there so much mercury in fish? Was this always a problem and we only just now know about it, or is it really a recent thing? Toxic to humans, to cause damage mercury must first get inside our bodies, either when we inhale it, get it into an open wound or eat it. While it is present naturally, human activities, including coal-fired power plants, have sent vast quantities of mercury into the air. More specifically, approximately half of the mercury in the air comes from natural sources such as volcanic eruptions, with the other half being a result of human activity. The bulk of this, about 65%, comes from stationary combustion sources- mostly coal-fired power plants. The next greatest man-made source of atmospheric mercury is 18% from the processing of non-ferrous metals (most notably gold, making up more than half of that 18%), then about 6% from cement production, among other relatively minor sources. 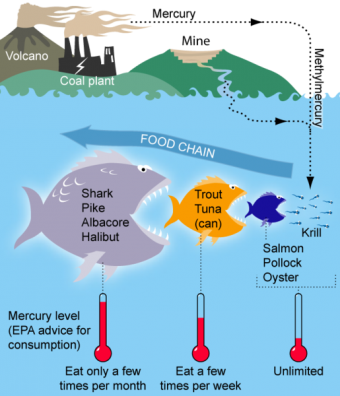 Once the mercury is in the air, it ultimately falls into the oceans, lakes and rivers, then finds its way into fish, which are eaten by humans, with the mercury then stored in our fatty tissues (like those found in brain cells) with terrible consequences. There are three primary forms of mercury; in ascending order of toxicity they are elemental (Hg), inorganic (HgII) and organic. Elemental mercury is the kind that is solid at room temperature (and looks silvery); this form evaporates when heated and is toxic when it enters the body (such as when it is inhaled). The mercury found in power plant emissions is a combination of Hg and HgII, and this is what eventually is deposited into bodies of water. Once there, Hg and HgII are transformed (methylated) into the most dangerous type of mercury, organic, and specifically, methylmercury (MeHg). Until recently, we weren’t quite sure how the aquatic environment affected such a disastrous change. Regardless, one way or another, the mercury turns into MeHg, enters the food chain and bioaccumulates (i.e., levels continue to be gained faster than they are lost). At the lowest level of the chain, phytoplankton (tiny, single-celled algae) absorb MeHg from their environment before they are eaten by slightly larger zooplankton. At this stage, some MeHg is assimilated but the small animal is able to eliminate most of it with its waste products. However, the zooplankton are eaten by small fish, and as the assimilation process repeats itself, more mercury is absorbed. The smaller fish are in turn eaten by ever larger fish, and at this level, the mercury is “highly assimilated and lost extremely slowly.” Thus, in long-lived fish at the top of the food chain like Bluefin and Ahi tuna, swordfish, walleye, marlin, king mackerel, orange roughy and shark, methylmercury levels, particularly in the fillets, can be very high. The National Resources Defense Council (NRDC) recommends these fish should be avoided. Why? Mercury, and in particular MeHg, is a neurotoxin, interfering with both the brain and nervous system. Particularly detrimental to developing fetuses and small children, even at low doses mercury exposure in humans can cause delayed development in talking and walking, interfere with attention and cause learning disabilities. In fact, high doses of mercury prenatally or during infancy can lead to deafness, blindness, cerebral palsy and mental retardation. Adults who are exposed to mercury may suffer tremors, vision loss, numbness in fingers and toes and even memory loss. Some evidence suggests mercury exposure may even lead to heart disease. In recent years, the Environmental Protection Agency (EPA) has promulgated rules to help slash emissions of mercury and air toxics (MATS) from power plants. For instance, mercury emissions from coal burning plants are to be reduced by 90%, acid gas emissions by 88% and sulfur dioxide emissions by 41%. The agency estimates that once the MATS standards are fully implemented it will “prevent up to 11,000 premature deaths and provide $90 billion in health benefits annually.” The costs to oil- and coal- burning power plants to implement the standards are expected to reach about $9.6 billion each year. One day on the planet Mercury (i.e -the time it takes to rotate around its axis once) lasts 176 Earth days. A year on Mercury (i.e – the amount of time for Mercury to orbit the Sun once) is 87.97 Earth days. In that sense, it remains daytime for a full year on Mercury and it stays night for one full year also. Fish are primarily white meat due to the fact that they don’t ever need their muscles to support themselves and thus need much less myoglobin or sometimes none at all in a few cases; they float, so their muscle usage is much less than, for instance, a 1000 pound cow who walks around a lot and must deal with gravity. Typically, the only red meat you’ll find on a fish is around their fins and tail, which are used almost constantly. The aforementioned potentially mercury methylating protein, hgcA, is present in at least one species of bacteria that lives in the human digestive tract. In addition to avoiding fish with the highest mercury levels (listed above), the NRDC recommends the following: eat only 3 servings or less a month of bluefish, Chilean Sea Bass, Spanish mackerel, grouper and canned albacore and yellowfin tuna. Other fish that may be eaten a bit more frequently, but no more than 6 times a month, include Alaskan cod, Pacific croaker, halibut, freshwater perch, lobster, mahi mahi, carp, black and striped bass, monkfish, canned chunk light and skip jack tuna, jacksmelt, skate, sablefish and sea trout. Seafood that may be freely eaten include catfish, clams, anchovies, crab, crawfish, Atlantic croaker, flounder, herring, hake, haddock, butterfish, North Atlantic mackerel, oysters, ocean perch, salmon, sardines, scallops, pollock, plaice, shrimp, American shad, Pacific sole, squid, tilapia, trout, whiting and whitefish. How Does Toxic Mercury Get into Fish?